THE HUD $100 DOWN PAYMENT PROGRAM. TO BE ABLE TO TAKE ADVANTAGE OF THIS GREAT PROGRAM YOU WILL HAVE TO USE FHA FINANCING TO PURCHASE THE PROPERTY. With the recent housing market crash and the credit crunch the options for buying a home with no or low payment has been pretty much wiped out. But there is one great option still available in some parts of the country and that is buying HUD homes for sale by using the HUD $100 Down Payment Program. Ok, now to the good part, the HUD $100 Down Payment Program. To be able to take advantage of this great program you will have to use FHA financing to purchase the property. The normal down payment for a FHA home loan is 3.5%. The main reason HUD offers the $100 down payment program is to sell HUD foreclosed homes fast and also to get owner-occupant into the homes. They believe people who own their home will take care of it better than a renter thus improving the neighborhood. This program is only for people who are going to buy the homes to live in. It is not for investors! Of course this is a government program which means there are some strings attached to the program. This program is not nation-wide; it is currently being offer in about half of the states. 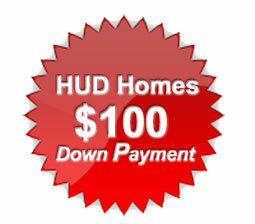 The HUD $100 Down Payment Program is a great way to purchase a home if you do not have a lot of money for a down payment. It will give you the opportunity to buy a home now while the home prices and the interest rates are low!